One beautiful Sunday afternoon a few weeks ago the girls and I went to checkout the Baltimore Streetcar Museum. Located on Falls Road just south of Hampden, The Streetcar Museum is a smaller building on a stretch of Falls Road that doesn't get a ton of traffic. To be honest with you despite the fact that it is less then five miles away from my house and that I worked for a few years on the same stretch of Falls, I had no idea it even existed until about a year ago. A few friends have recommended checking it out and after our trip I can definitely see why. The Museum is open Sundays from 12-5 year round and then Saturdays from 12-5 starting in June through October. Kids under 4 are free and the admission for kids over 4 is $5. For adults the admission is $7. Your admission allows you to come into the museum and check out all the models and streetcar history, which the girls really liked. They enjoyed looking at all the small streetcars models and miniatures. However the best part is that your admission covers unlimited streetcar rides! It seems they run a different streetcar every 10 minutes or so and you can ride as many times as you want. 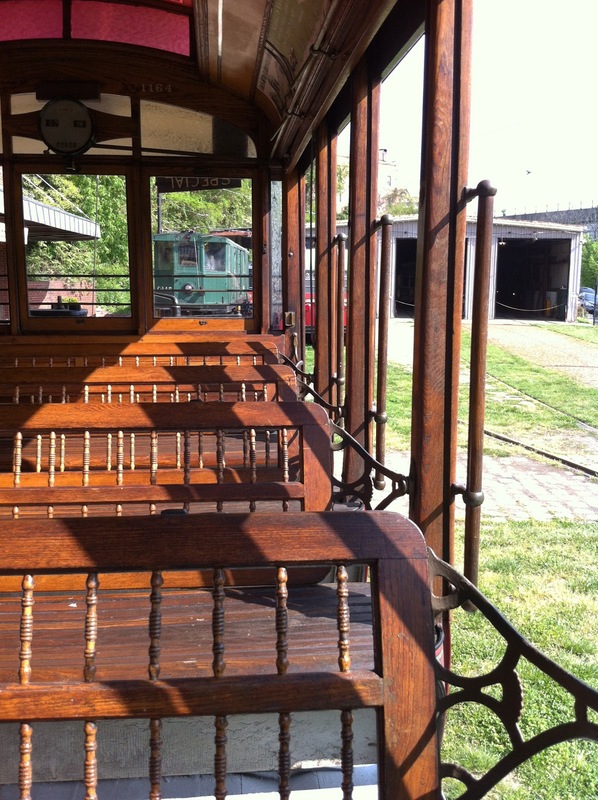 Each ride takes you down the tracks along Falls Road, driven by a conductor who gives you a little history and information about streetcars and the different models. The girls loved the ride and I was fascinated by the history lesson. The ride takes you back to the museum where you can check out the models inside or some of the streetcars outside while you wait for the next ride. They also have benches and bathrooms for you to use while you are waiting. We only rode a total of two streetcars, because we had to get home, but I would love to go back again! One of my favorite places growing up! It's been a while since I've been back but I enjoy running by it on the Jones Falls Trail. I highly recommend going back as an adult who grew up in Baltimore too I found it so interesting. How is that part of the trail? I saw lots of bikers there but we have never been?